China foreign minister says wants to manage disputes with U.S.
China wants dialogue with the new U.S. administration to manage disputes and promote bilateral relations, but only on the basis of respecting each other's core interests, like the "one China" principle, China's foreign minister said. U.S. President Donald Trump, who was inaugurated on Friday, upset Beijing before taking office by casting doubt on the "one China" principle, under which Washington acknowledges Beijing's position of sovereignty over self-ruled Taiwan. China views Taiwan as a wayward province, to be brought under its control by force if necessary. However, proudly democratic Taiwan has shown no interest in being ruled by Beijing. Speaking at a reception for the upcoming Chinese Lunar New Year, Foreign Minister Wang Yi said the future direction of Sino-U.S. ties had "attracted attention". 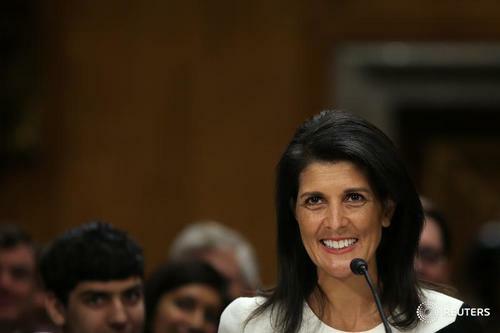 "We are willing, on the basis of strictly abiding by the 'one China' principle and respect of each other's core interests, to have dialogue with the new U.S. government," Wang said, in comments posted on the ministry's website late Tuesday. China is willing to "increase mutual trust, focus cooperation, manage and control disputes and promote the healthy development of China-U.S. relations, to bring even greater benefits to both peoples", he added. 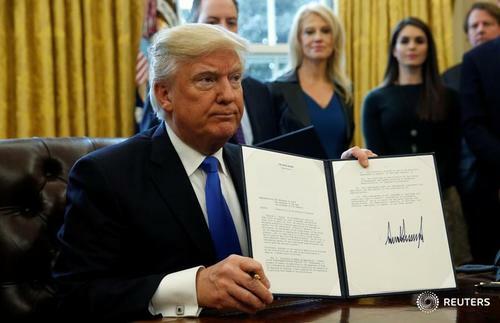 ReutersPresident Donald Trump was expected to sign several executive orders restricting immigration on Wednesday, at the U.S. Department of Homeland Security, according to several congressional aides and immigration experts briefed on the matter. ReutersUnder pressure from President Donald Trump, Mexico is preparing to discuss changes to trade rules about a product's country of origin to try to avoid a disruptive fight with the United States over commerce. ReutersU.S. President Donald Trump's administration has put staff at a slew of government agencies on notice - be careful what you say. "He believes what he believes based on the information he's been provided" — Spicer says of false Trump claim that millions voted illegally. White House Press Secretary Sean Spicer fields questions from media on Trump's comments on voter fraud. 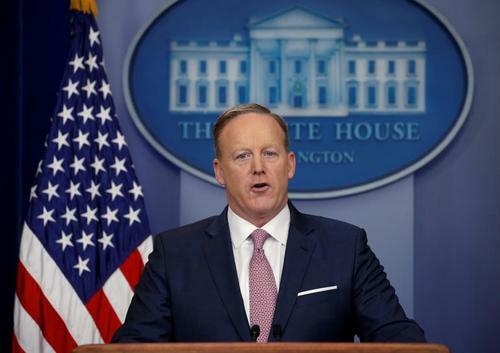 White House Press Secretary Sean Spicer says President Donald Trump wants to ensure Keystone XL, Dakota Access pipelines result in best deal for taxpayers. JUST IN: Trump action on #DAPL is being done 'hastily and irresponsibly' - lawyer for Standing Rock Sioux tribe. MORE: Standing Rock Sioux tribe says will take legal action to fight Trump's #DAPL order. President Trump today signed executive actions to accelerate the Keystone XL and Dakota Access pipeline projects and to decree that American steel should be used for pipelines built in the United States. Trump also signed an action to expedite environmental review and approval of high-priority infrastructure projects that he hopes to get moving as part of his drive to rebuild U.S. airports, roads and bridges. Trump told reporters that "we are going to renegotiate some of the terms" of the Keystone XL project. "And if they like we will see if we can get that pipeline built - a lot of jobs, 28,000 jobs, great construction jobs." He said the Dakota pipeline would be "subject to terms and conditions negotiated by us." Trump said his order on pipelines "will put a lot of steelworkers back to work." 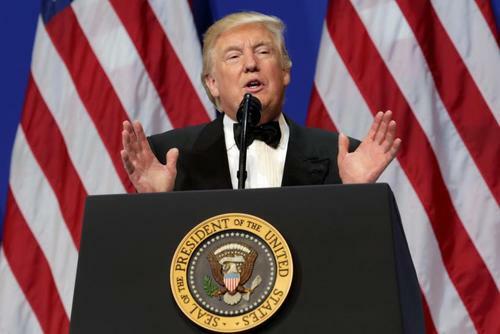 "We are very insistent that if we are going to build pipelines in the United States, the pipes should be built in the United States," he said. 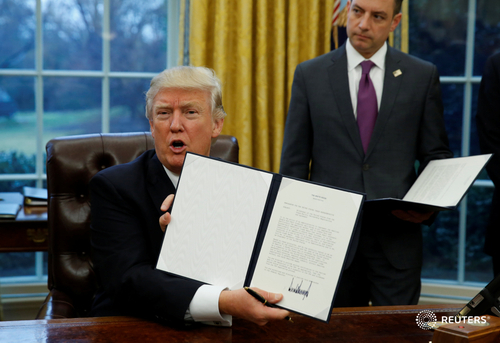 President Donald Trump signs executive orders approving the Keystone and Dakota Access Pipelines, subject to terms and conditions. ReutersThe White House said on Monday that national security adviser Michael Flynn held just two phone calls with Russia's ambassador to Washington, amid reports that Flynn's communications are being scrutinized by U.S. counterintelligence agents. ReutersPresident Donald Trump's press secretary promised reporters on Monday that he would never lie after a weekend briefing in which he made statements about the crowd size for Trump's inauguration that were debunked. 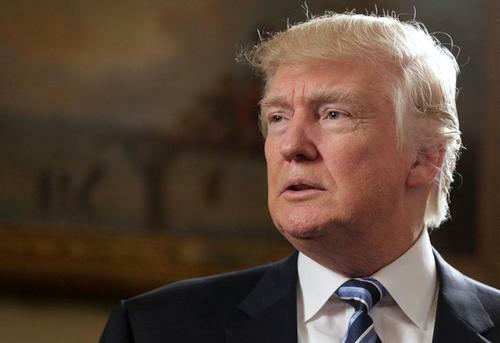 Trump formally withdraws the United States from the Trans-Pacific Partnership trade deal, distancing America from Asian allies as China's influence in the region rises. A top Trump adviser will meet this week with advisers to Canadian Prime Minister Justin Trudeau, whose Liberal government is gathering to plan a response to a possible renegotiation of the North American Free Trade Agreement. 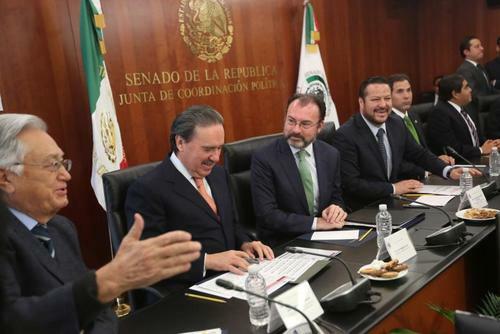 Mexican President Enrique Pena Nieto says the country will aim to keep tariff-free commerce with NAFTA partners Canada and the United States in its talks with the Trump administration. Trump will discuss expanding trade with Britain when he meets British Prime Minister Theresa May at the White House on Friday, although trade may not be the central focus of their conversation, the White House says. Trump meets with a dozen prominent American manufacturers at the White House, promising to cut regulations and corporate taxes but warning them of penalties if they move production outside the country. Trump plans to meet on Monday at the White House with leaders of construction and sheet metal unions, two sources tell Reuters. 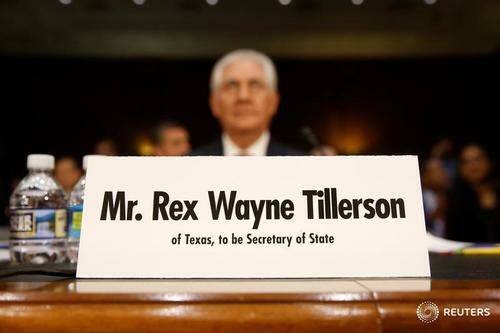 U.S. Republican Senator Marco Rubio says he will reluctantly back Trump's nominee for secretary of state, Rex Tillerson, in a move that all but secures Senate confirmation of the former Exxon Mobil CEO. 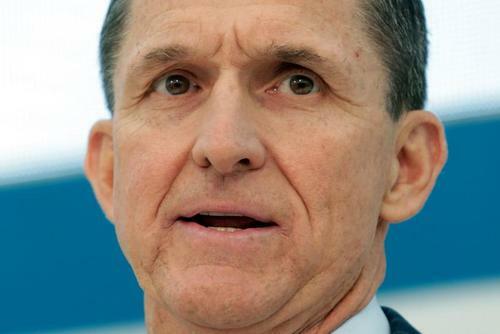 Michael Flynn, Trump's choice for national security adviser, held five phone calls with Russia's ambassador to Washington on the day the United States retaliated for Moscow's interference in the U.S. presidential election, sources say. 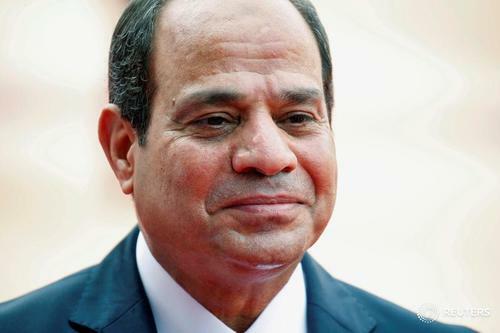 Egyptian President Abdel Fattah al-Sisi discussed fighting terrorism and extremism in a telephone call with Trump, and Trump applauded Egypt's efforts on those fronts, Sisi's office said. The Kremlin expects to agree soon on a date for the first phone call between President Vladimir Putin and Trump, but there is no word on when they will meet. Gulf Arab states are quietly applauding the arrival in the White House of a hawkish leader opposed to their adversary Iran, even if they suspect Trump might at times heighten tensions in the Middle East. A White House spokesman says Trump will announce a nominee in the next couple of weeks to fill a vacancy on the U.S. Supreme Court. U.S. Republican Senator Susan Collins says Trump's executive order last week targeting Obamacare is "very confusing," and she offers her own replacement plan. Trump dismisses allegations in a new lawsuit by prominent constitutional and ethics lawyers that he is violating the U.S. Constitution by letting his hotels and other businesses accept payments from foreign governments.
.@PressSec tells me he's unsure whether Trump will maintain Obama's EO against anti-LGBT bias in workplace. "I just don't know the answer."